Welcome, friends! I’m so thrilled you’re here! The Seasonal Simplicity Summer series is back today; and this time we’re sharing all kinds of free printables for summer! I hope you enjoy these! 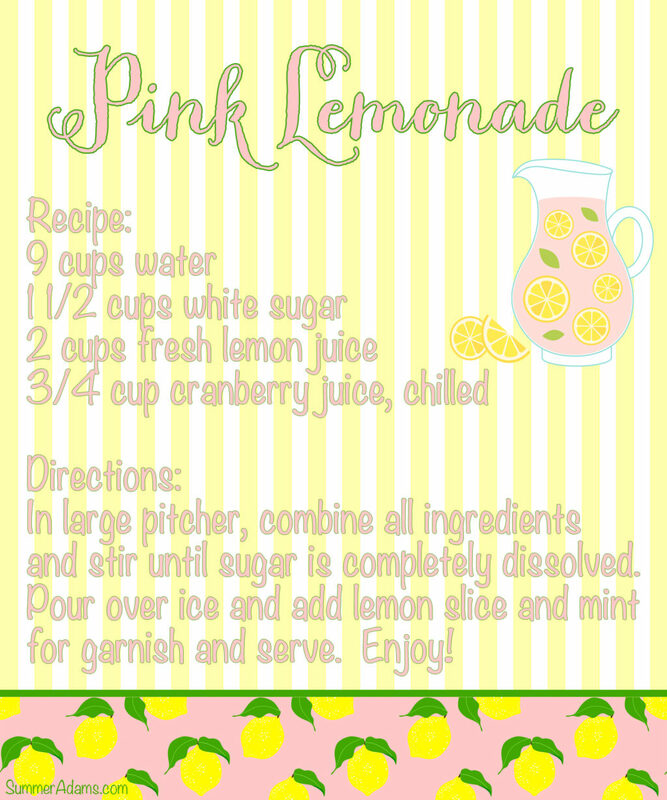 I have a fun printable recipe card for my homemade pink lemonade recipe. I know you’ll just love it as much as my family and I do. It’s the perfect summer drink to cool off and quench your thirst on a hot day! I love summer recipes! Popsicles, ice cream, and anything else that cools me off. I especially love all things lemon in the summer. 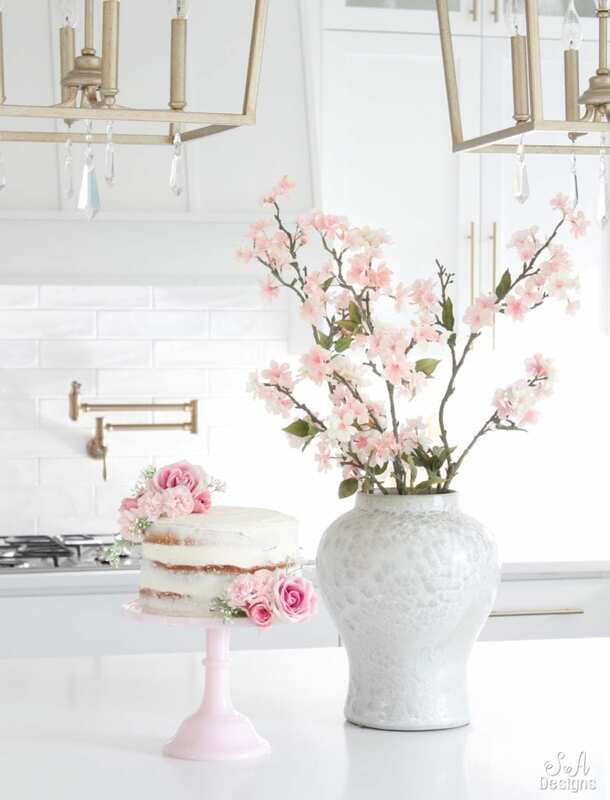 I recently made a Pink Lemonade Chiffon Naked Cake that is to die for! 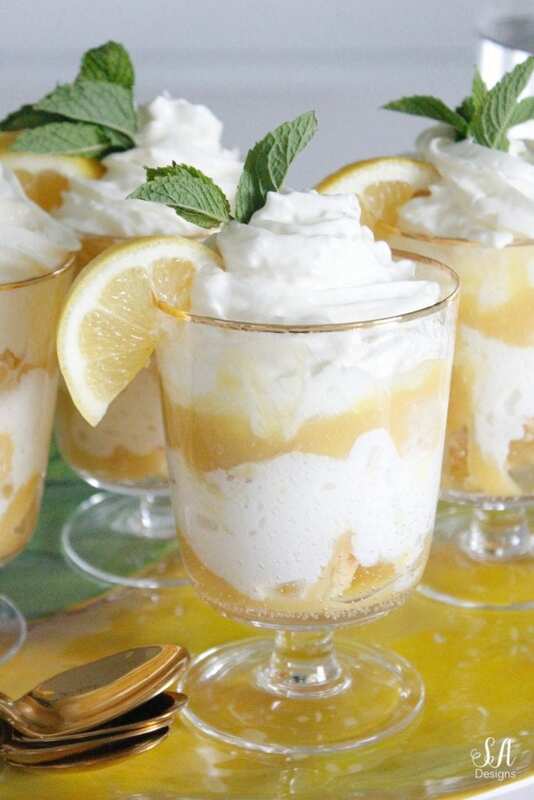 Then my mom came into town and suggested we make these Lemon Curd Parfaits and wow….they were so divine. 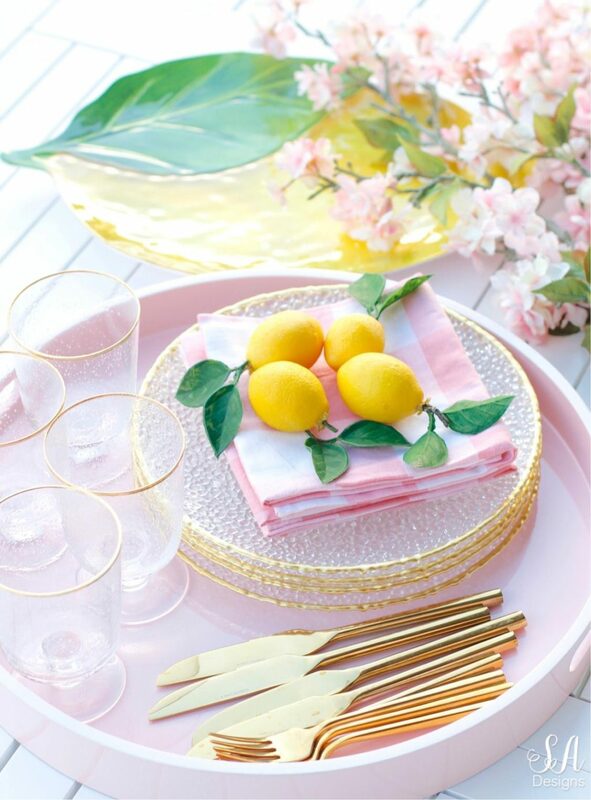 I also set the cutest Pink Lemonade themed outdoor table for dinner with a few girlfriends last week. Read all about that HERE if you haven’t yet seen how it turned out. It was pretty fun and so cute to put together. 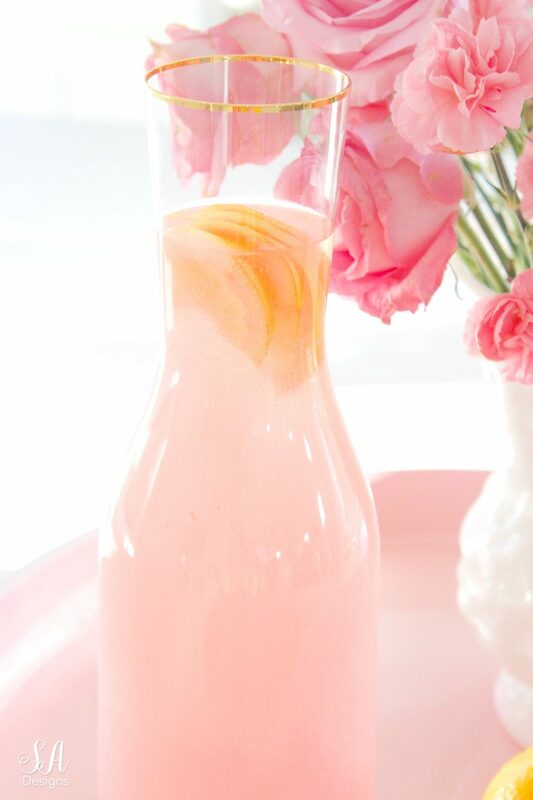 I served pink lemonade at that dinner but it was bottled pink lemonade. It was tasty but as I was taking a sip, I was thinking how much I’d rather have been drinking a homemade pink lemonade. It’s the easiest recipe ever so I wanted to share it with you today. In large pitcher, combine all ingredients and stir until sugar is completely dissolved. Pour over ice and add lemon slice or mint for garnish and serve. Enjoy! *Variation: To make sparkling lemonade, use club soda instead of water. Also, you can always make a simple syrup with the sugar and water first on the stove and then mix it in with the other ingredients so that you don’t have to wait for all the sugar to dissolve. I made a darling printable pink lemonade recipe card for you to give a friend if they want your recipe (because they will…it’s that good). I also had another idea…. I have a bunch of these cute little milk bottles with lids in one of my cabinets. 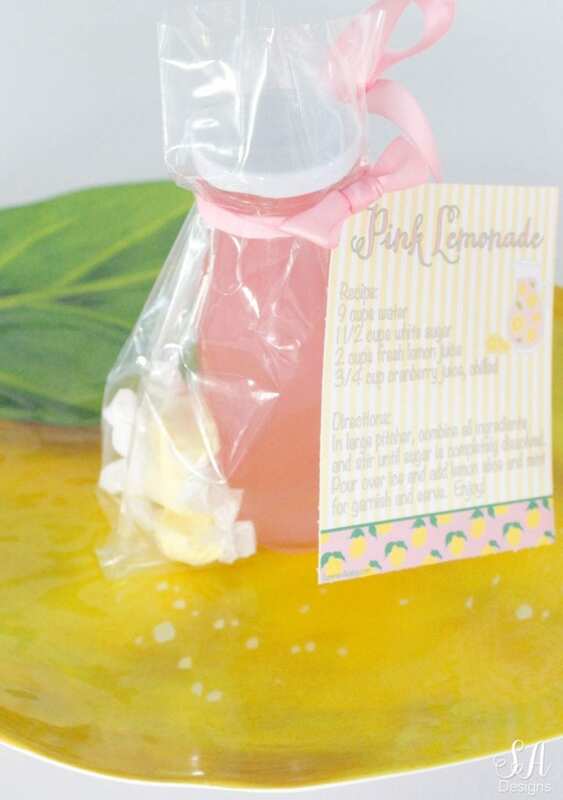 I thought it would be fun to fill them with my pink lemonade and run them over to a few neighbors or friends for fun. It’s something other than cookies and I thought they’d like it. 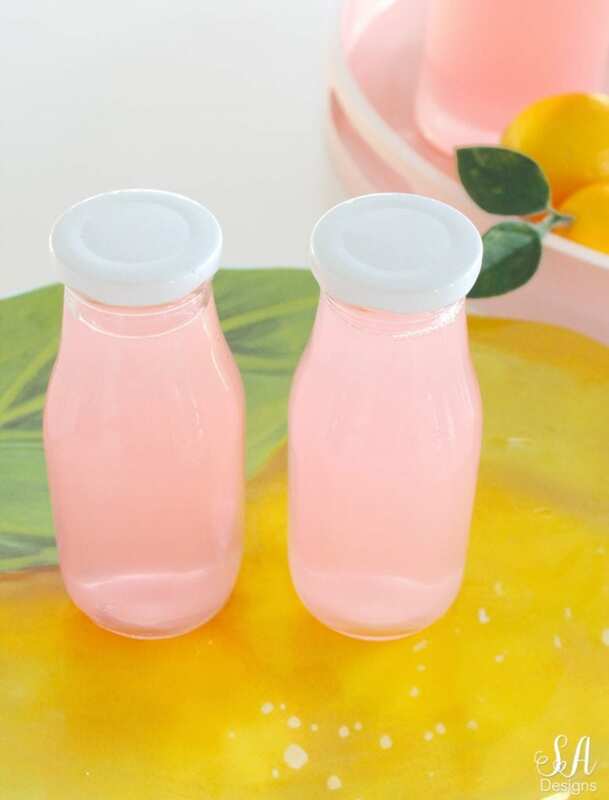 I also remembered that I had recently bought some yummy lemon saltwater taffy in bulk at our grocery store and thought it would be cute in a small clear bag with the bottle of homemade pink lemonade. I wish I had taller bags but this is what I had on hand and I have a ton of them. You could buy the taller bags if you wanted to do the same thing. I just punched a hole in the cute printable and tied it with a pink double-sided satin ribbon around the top of the bottle. Fun right?! I had all of this at home already so I always get excited when I realize I can actually put to use the things I hoard save for just the right moment…ha! They were a hit! 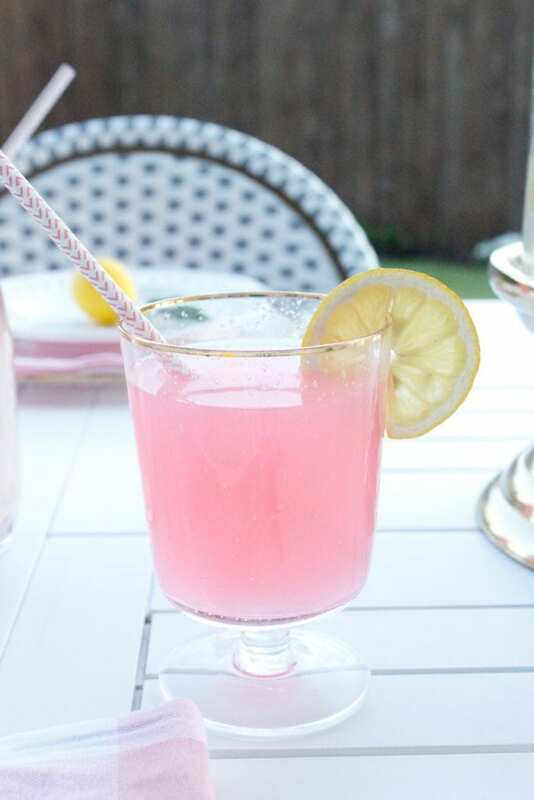 This homemade pink lemonade recipe is also the perfect drink to make and serve out by the pool or just outside to kids and friends. This was a hot day and so, while in my swimsuit and coverup, it was the perfect thing to bring out to everyone playing in the water! Here is the printable below. Click on the bold link to print or right-click the image below to save and print at any size by adjusting. Just remember that it is for personal use only and may NOT be sold or reproduced for commercial use. DON’T FORGET TO PIN THIS POST AND SHARE THE LOVE! You can hover over any of my images on the top left and a “pin it” icon will appear! Please visit my talented friends below that are joining me today! They are all so creative! 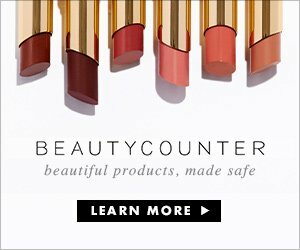 These are so cute, Summer! Love the pink lemonade theme you have going! Thank you so much for sharing. Hope you’re having a wonderful week! It sounds delicious and oh so pretty!! Beautiful set up and the printable adds the perfect touch. 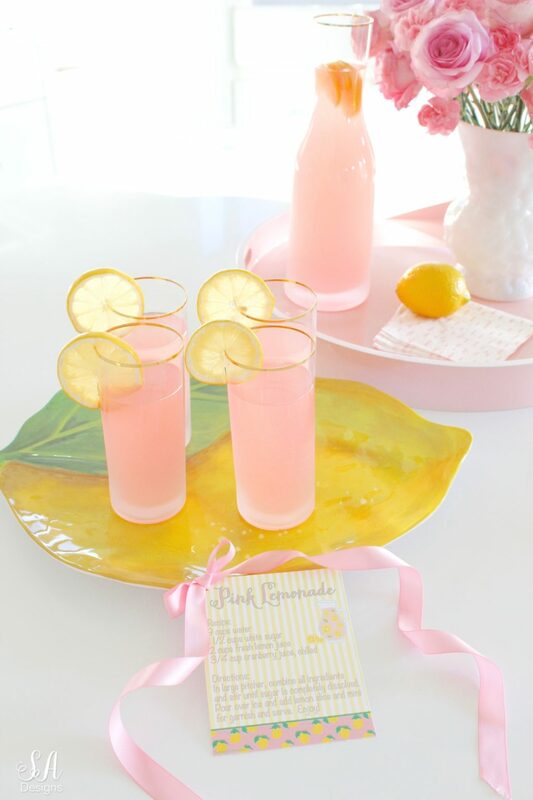 This is such a great idea – and I love your pink lemonade! What a cute summery combination. Thanks for joining in on this hop, friend! Happy summer! OH Krista you’re the sweetest, thank you!!! I’m so glad you like it and I’m so glad to have been included in this fun tour! I’ve been printing some of the printables already! So fun… Happy summer!